Updated Thursday January 24, 2019 by South Lakeland Baseball. For our Rookie, Billy Ripken, Cal Ripken and Prep Divisions, our regular registration will end January 21, 2019. After this date, a $10 late registration fee will apply to cover cost of shipping and printing any late uniforms. Also, we will be unable to guarantee a roster spot for players who are registered after January 25, 2019. For our Smart Start and Coach Pitch Divisions, our regular registration will end January 21, 2019. After this date, a $10 late registration fee will apply to cover cost of shipping and printing any late uniforms. Also, we will be unable to guarantee a roster spot for players who are registered after January 25, 2019. Spring 2019 Registration is open through our website. 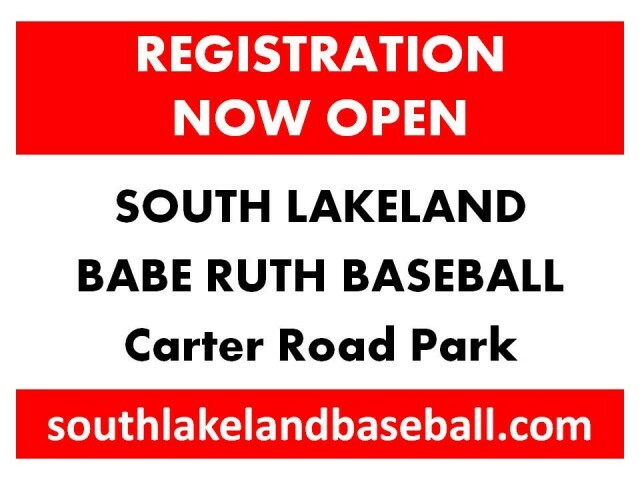 If you have difficulty with the registration, please e-mail registration@southlakelandbaseball.com. We will host in-person registration at the north quad (fields 5-8) on January 12th and 19th from 9am to 1pm. People can also register online in advance and pay in person with cash or check on one of these two dates. Registration fees can also be paid during the week of player evaluations. SLBRL also aims to accommodate the needs of larger families by offering a $300 cap per family. Please contact a board member for more details.